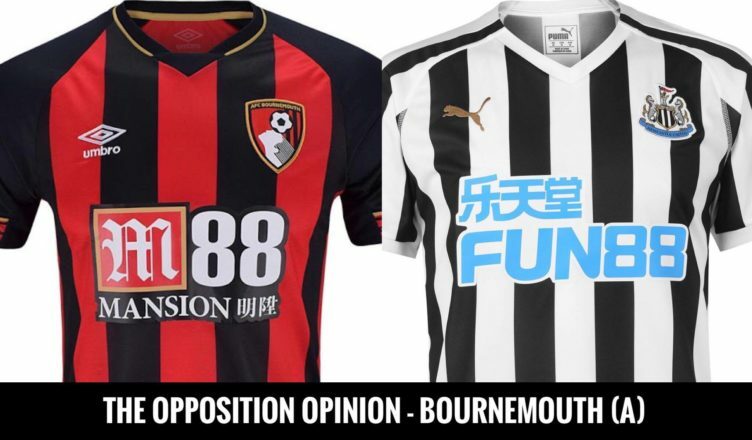 The Opposition Opinion – Bournemouth (A) – “Turn up and they could tear you apart..” – NUFC blog – Newcastle United blog – NUFC Fixtures, News and Forum. For this week’s Opposition Opinion piece, we’ve been speaking to Cherries fan Chris Appleton ahead of our trip to the Vitality Stadium. As ever, we are looking to bring you a view from ‘the other side’ before this week’s game, chatting to an opposing fan to gain their opinions on NUFC, some insights into their own side and their thoughts on our upcoming match. “If you’d asked me this just over a week ago I would’ve said no as we’ve been on an awful run, but the win over Huddersfield was a positive one in more ways than one. “Wilson was back and looked brilliant, with him seeming to revitalise Fraser too. Those two have been our standout players this season, so to have them both back at it and amongst the goals was great to see. Q2) – Who are the strengths and weaknesses in your current side? Also, have you got any ‘ones to watch’ that most NUFC fans wouldn’t know much about? “King is another good attacking option, being surprisingly strong and good in front of goal, but I’m a big fan of David Brooks. He’s our ‘one to watch’ having shown maturity beyond his years and looking such a clever player. “Ake is one to watch at the back. We rate him, but he’s not the biggest so Rondon could bully him. He certainly did when we lost at your place last year! “Rondon has really impressed me this season, but I can’t lie, he never looked up to much when I watched him at West Brom, being erratic in front of goal and a bit too inconsistent for my liking. “He bullied us when you beat us at St James’ and seems to link up very well with Perez – a player who I’ve always rated and would like to see at Bournemouth! “Ritchie is a funny player. He’s a strength and a weakness if you ask me. He works so hard and has great quality on his day, but his lack of pace makes him a bit limited at this level as a winger. “Shelvey is the same. So much quality but he switches off defensively. “I think there’ll be goals, mainly because I see Schar and Lascelles will be missing for you, but I have no confidence in us keeping another clean sheet’. “You’ll try to counter us and while you might have a bit of joy now you have players like Perez, Rondon and Almiron firing on all cylinders, I think we’ll have some joy against what might be a make-shift back four. Q5) – If you could sign one player from this NUFC side, who would you like to see Eddie Howe go for? “Perez for me. I really rate the lad. “He seems to work hard but have flair at the same time, and that’s hard to find. Q6) – Finally, if you had our two squads to choose from and were asked to pick the best possible side, what would you starting 11 be? “Very attacking, but that’s a strong side! I get the feeling he’s far more confident now Wilson is back, but their form prior to last weekend’s win over Huddersfield had been very poor. Next up will be the thoughts of an Arsenal fan ahead of our trip to the Emirates two weeks on Monday.